TRAINING for the diocesan priesthood in Queensland has entered a new era with the opening of Holy Spirit Seminary. The new facility replaces Pius XII Seminary, commonly known as Banyo Seminary, which has served the five dioceses of Queensland for more than 60 years. Five first-year students have moved into Lanigan House, a former convent on Church land in Wavell Heights which has been used to accommodate seminary students for the past few years. 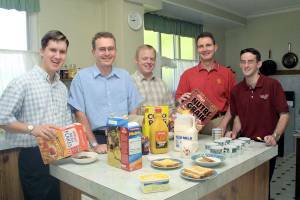 They join 15 others who are at various stages of formation for the priesthood, and who are living in two nearby houses – Gerry House and Tooroonga House – or in other parishes. The Banyo site is now home to St Paul’s Theological College and will also accommodate the relocated McAuley Campus of Australian Catholic University which is currently at Mitchelton. Holy Spirit Seminary rector, Fr Michael McCarthy, said this year’s relocation to Wavell Heights parish would allow for closer links with the parish environment in which seminarians will live and work when they become priests. Three seminary students are preparing for ordination to the priesthood in Brisbane archdiocese later this year. They are Daniel Redhead, John Hong and Steven Hartley. Of the five first-year students beginning their formation at Holy Spirit Seminary, Jason Middleton, Peter Gabloinski and Paul Chandler are from Brisbane archdiocese, Andrew Hogan is from Rockhampton diocese, and Christopher Kerlin is from Cairns diocese.